Hope you are all doing great this week. I am going to do a post on something I have wanted to share with you for a very long time. Some of you may have known that I am crazy about Korean Cosmetics. Ever since my friend Nicole, who lived in Korea, sent me a box of goodies I was hooked! I decided to buy and explore some more Korean products and brands via Ebay. Etude House is one of the most famous and most affordable brands in Korea. Their packaging is always super cute and girly. I especially love their lipsticks. I have been loving their skin care products too and wanted to share my holy grail toner with you. Now I know that many of you will not be able to get your hands on these products. I am going to blog about them any way because it is great to learn about the array of beauty products around the world and expand your knowledge on other cosmetics out there. Beauty and cosmetics are so much fun and I want to share some of the products that bring me so much delight. So here we go! The Wonder Pore range by Etude House consist of products that are targeted at people with oily skin and large pores. The range is extremely gentle and consists of face washes, toners, masks and creams. 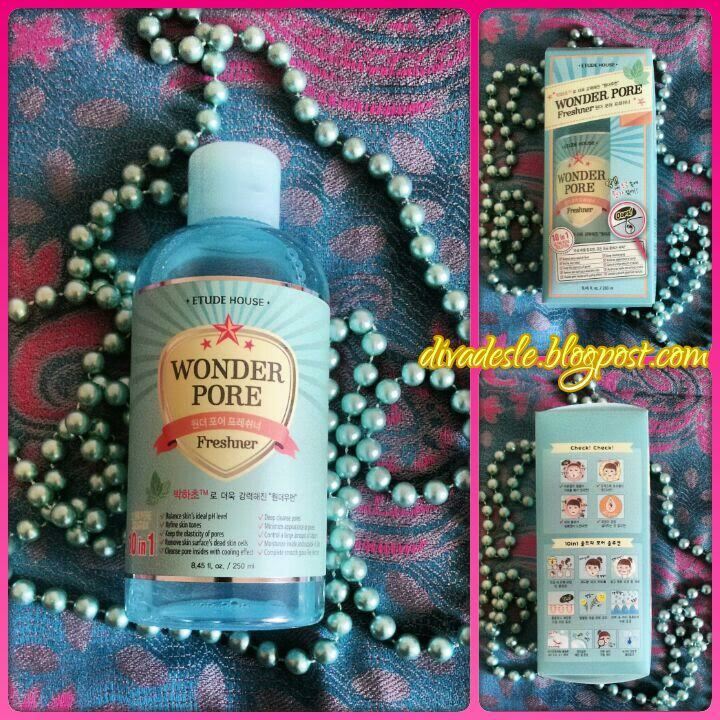 The Wonder Pore toner is one of my favourite products of life! I swear I have been through four bottles of these and I cannot get enough. I initially bought it because everyone on the interwebs was raving about this glorious product. I wanted to see what the hype was all about. I was not disappointed at all. Even though my skin is combination this toner is perfect to use on almost all skin types because it is so gentle. Most toners burn my skin and eyes terribly and leave my skin feeling sticky. This one is a dream to use and cleanses my face without drying it out or causing irritation. After a year of using this product I would say that the toner definitely cleanses my face, while moisturising it. This is perfect for controlling excessive sebum production too. I do not have very enlarged pores but I do notice a tightening effect and my pores look and feel a lot cleaner and less clogged up. I wear a lot of bb creams and foundations during the day, which if not removed properly can cause breakouts and blackheads. I usually place the toner on a cotton pad and wipe my face thoroughly after I have washed my face. You will never believe the amount of dirt that is left on my cotton pad after using it. This toner does an excellent job in cleansing pores. Some people love to splash the toner on their face instead of placing it on a cotton pad. I prefer to use a cotton pad as I mainly use toners as an extra step to cleanse my face, rather than using it as an extra splash of moisture. The toner does contain alcohol so if you are sensitive to skin care products containing alcohol then be sure to take care when using it. The product comes in a 250ml bottle with Korean writing and the cutest blue packaging. I am absolutely in love with this product and dread the day I have to purchase more. Since our currency the Rand is falling drastically on the global market it has been really difficult to shop overseas brands due to high custom tax, inflation rates and currency exchanges. Super sad!!! I always wondered about this product Desle! Glad it works! I have dry skin, but I'll definitely recommend this to my friends with oily skin. Thanks. Such a thorough review! Your blog is cool!! I love beauty reviews!